The above table show’s “Pure” Ethanol’s boiling temperature is 172 degrees Fahrenheit. When distilling however this is not the case because the Ethanol in the wash is diluted by other products mainly water. This directly effects the boiling temperature, the more water in the solution the higher the boiling temperature of the mash will become. This can be seen by installing a temperature gauge in your boiler and measure the temperature of your mash as it boils. Note the temperature when your still starts producing ethanol will be far higher then the boiling point of Ethanol. 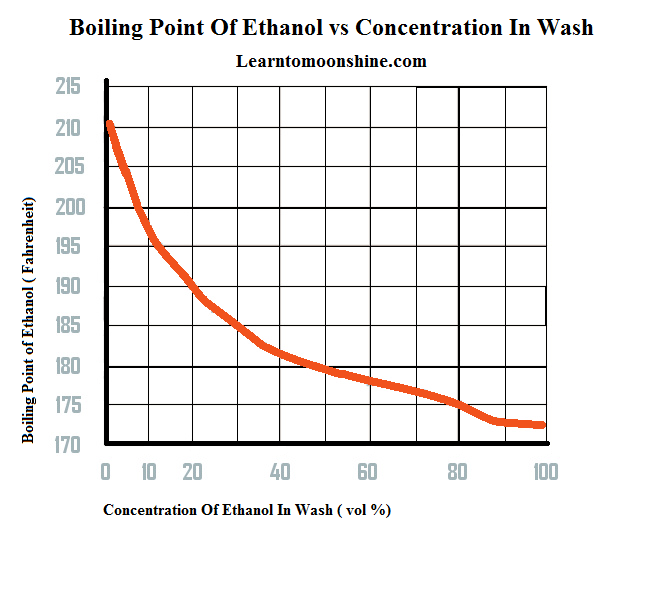 To Illustrate this I’ve added a chart below that show’s the boiling temperature of ethanol as a function of concentration of ethanol within your wash.
What’s the Difference between Vapor Temperature and Wash Temperature ? The Wash temperature is measured in the boiler were as the Vapor temperature is measured in the Head or Column of the Still just before the condenser. The Vapor temperature can be used for making cuts during the distillation process. Knowing when to start collecting moonshine from your still and when to finish is very important. You will often start to see some product dripping from your still when the Head / Column temperature reaches 56 Celsius. But generally the temperature range that you want to collect Moonshine within is between 78-82 °C and we generally stop collecting the distillate once we start getting fusels coming out. This is generally happens at a head temperature of 94 °C or higher. To Learn more about the process of Making Moonshine Head over to our Distilling 101 page. 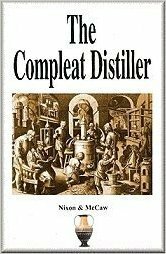 9 Responses to "Still Temperature Guide For Making Moonshine"
Maybe there is no difference but I was told to go slowly will ensure a better quality of distilling.According to your experience what should be the average distilling time of 10 gallons of mash with 13 % alcool ? I will use a keg with 3foot high 2inch copper colunm. Thanks for the hits, like you have said. I will do several tests to find what I like the best. Lot of fun to follow ! however I am intrigued to go bigger in the Proper American Old School Good Moonshine have a 70 L at present but want to go bigger and want to try different methods with non reflux and reflux and it is difficult and costly to try and have a still shipped from USA to South Africa. At what temp should your worm start dripping and stop driping. My last run didn’t turn out very good it was a wheat wash and taste grainy. Should use a thomer in the worm?? Should you keep the temperature at below 78deg C for a while to get as much of the Methanol out. Or will heating it slowly do the same thing. I like to let my column balance out in full reflux mode for about 10 min before I start collecting. You can do this easily with a PID controller, It will allow you to set the temperature of your still head to a certain temp and maintain that temp + or – a degree. This will allow most of the Methanol to come to the top of the still head. If your running a liquid management reflux still you can close the take off valve fully this will put your still in full reflux mode.